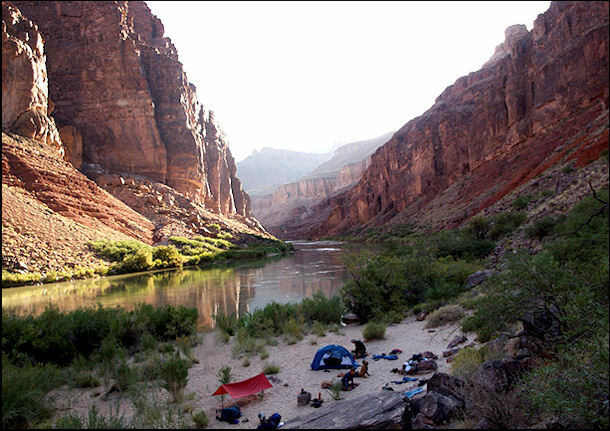 It’s not a secret to many hikers that acquiring permits for backpacking trips in the Grand Canyon has become an intensely competitive process with thousands of requests arriving every month and many people leaving empty-handed. One of the reasons for this is the overwhelming focus by many on “The Corridor” which comprises the most moderate – and most popular – trails in the Canyon. For this hiking review, I’m going to focus on an equally beautiful area with much more solitude and one tenth the permit competition. We call it the Horseshoe Mesa, Hance Creek, and Colorado River Adventure. Beginning at Grandview Trailhead, you’ll descend the Grandview Trail for 3 steep miles on a maintained trail. This trail is aptly named for it’s amazing views of a large expanse of the Canyon as well as distant view of the Colorado River snaking its way from the east. This trail was built by Pete Barry, one of the Canyon’s original entrepreneurs. He began mining, but even after finding some of the richest copper ore in the world, the transportation costs of getting the ore out ate up his profits. He eventually turned to tourism, even building a small lodge on the rim (which is no longer there). Horseshoe Mesa still boasts some amazing relics from the Pete Barry era, including his old cabin and an array of old, rusty mining machinery. At the Mesa, you’ll see a trail cutting to the right (east) and that’s the one you want to get down to Miners Spring and/or Hance Creek (2 of the 3 closest water sources). I recommend going all the way to Hance Creek the first day, which will take you another mile and a half past the Mesa, for a total of 4.5 miles of hiking that day. The drop off the Mesa down to Hance Creek is steep and rugged and should be traveled with caution. There are some spots where tripping is not an option. Hance Creek is a beautiful oasis in the desert, with a perennial flow of spring-fed, clear water makes for excellent camping. I recommend spending two nights here at Hance Creek and making a day trip to the Colorado River on your layover day, which is approximately 13 miles round trip. It’s a long day but totally doable. Hance Rapid is a breathtaking area of the Colorado River, decorated by the famous Red Canyon – one of the most beautiful layers in the Canyon. From here you can exit via the New Hance Trail, but I recommend camping the last night on Horseshoe Mesa. Start by circling around beneath Horseshoe Mesa on the Tonto Trail to Cottonwood Creek. Fill up your water here, with plenty for the night and the next day because there’s no water on the Mesa. Set up camp and go check out Cave of the Domes, which is the only cave in Grand Canyon National Park that guests are allowed into. Hike along the western edge of the Mesa until you come to the point where the last major ridge coming down off the butte in the center of the Mesa meets the trail. Keep an eye out to your left for a thin path that leads to the cave. It’s at the end of one of the major gullies that drains off the Mesa on the western edge. Bring headlamps along and be sure to turn them off to experience some absolute darkness (can’t even see your hand waving in front of your face). The last day will take you back up to the Grandview Trailhead at the South Rim, where you’ll fully deserve the shower and all-you-can-eat buffet that I’m sure will await you. Enjoy! Thanks to Scott Cundy, owner of The Wildland Trekking Company, for this report. 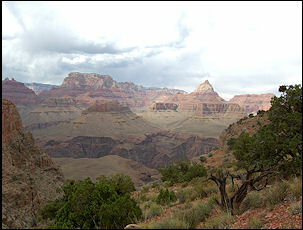 For more info on Grand Canyon hiking tours be sure to check out his company’s website. Then you can book your next adventure. Kelty Grand Mesa 2 Tent Review – A Winner or a Dud?